Lift Safe Direct has a wide range of gas cylinder handling equipment and gas cylinder trolleys. We manufacture single cylinder trolleys, twin cylinder trolleys and multi cylinder trolley carriers. We specialise in cylinder trolleys for hospital plus Oxygen/acetylene - Oxygen/propane cylinder trolleys and cylinder lifting trolleys for a variety of industries. We also offer an in-house design service. So if you cannot see a product to meet your requirements please contact our sales and design staff, we are sure we can help to design the cylinder handling equipment to meet your needs. 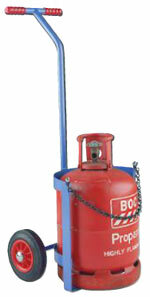 Small single gas cylinder trolley. A single cylinder trolley with adjustable cylinder collar designed for small size cylinders from 120mm to 220 mm diameter and 450mm to 1250 mm high. 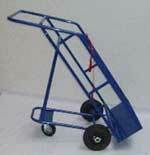 Small three wheel single gas cylinder trolley. A single cylinder trolley with adjustable handle height. designed for small size cylinders from 120mm to 220 mm diameter and 450mm to 800 mm high. 4 x small single cylinder trolley. 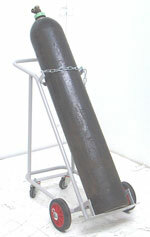 A cylinder trolley designed to carry four small sized cylinders, 120 to 204 diameters - 450 mm to 950 mm high. 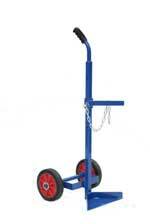 Porta Pack Cylinder Trolley for 2 cylinders.Fitted with 200 mm rubber tyre solid wheels as standard. To suit cylinder 160/213mm dia, 500/935mm high. Single oxy or acetylene trolley. Robust large single gas cylinder trolley for the safe transport or storage of single oxygen or acetylene cylinders from 230mm to 286mm diameter. Fitted with 200 mm rubber tyre solid wheels as standard. 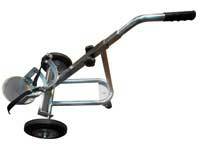 Extra heavy-duty oxygen or acetylene trolley to a single cylinder 230mm to 286 diameter. A strong tubular construction with full toe plate. 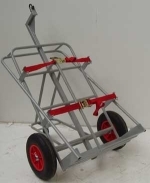 This trolley is ideal for the safe transport of a single cylinder in a workshop or on site. Fitted with 200 mm steel centred solid rubber tyre wheels as standard. Single oxygen/acetylene trolley climber. 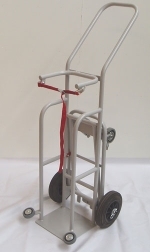 A Step climber trolley version of the CT11-S02. This trolley is ideal for those difficult to negotiate steps. Fitted with 6 x 150 mm rubber tyre solid wheels. Inverter trolley. This trolley is designed to carry a single full sized 230 mm diameter CO2/Argon cylinder and is fitted with rear shelf for an inverter T.I.G. set and a rod quiver. The inverter set is secured with a ratchet strap. (Please state Inverter set dimensions when ordering). Fitted with 200 mm steels centred solid rubber tyre wheels as standard. This trolley is designed to carry a single full sized 230 mm diameter CO2/Argon and comes with a plate on the rear of the truck, which will allow you to carry a small portable M.I.G. or T.I.G. Lincoln welder or similar. The set is secured with a ratchet strap. Please state welding set dimensions when ordering in additional information box. Fitted with 200 mm steels centred solid rubber tyre wheels as standard. 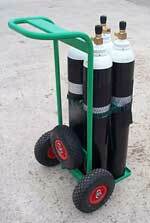 Medical trolley to suit oxygen gas cylinder. The trolley is designed to carry the following dia cylinders: 140mm, 175mm and 230mm. If this product doesn't suit your requirements then our sales team would be more than happy to discuss designing a bespoke cylinder trolley to suit your requirements. 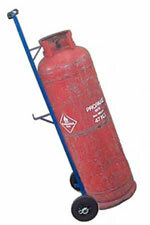 Robust large 4 wheeled single gas cylinder trolley for use with 230 mm to 280 mm diameter oxygen or acetylene cylinders. A very stable cylinder trolley ideal for uneven floors. 2 x solid rubber tyre wheels and 2 x steel centred, solid rubber tyre swivel castors. This robust single cylinder trolley holds one large 47 Kg propane cylinder, and is ideal for the safe transport and storage of a single cylinder. Fitted with 200 mm rubber tyre solid wheels as standard. 47 Kg single cylinder lifting trolley with central lifting eye for lifting with an overhead crane. The cylinder is held in place with a ratchet strap certified to one tonne capacity. Fitted with 2 x 8" steel centred wheels with solid rubber tyres, complete with tested 'D' shackle and mill test certificate. 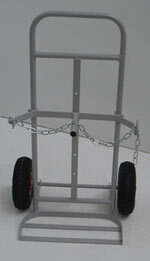 Tandem Cylinder trolley with steel link retaining chain fitted. 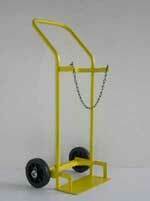 Ideal for moving multiple medical/gas cylinders around an hospital. Comes as standard in a blue epoxy finish. The CT26-3SP1 is a robust 4 wheeled single gas cylinder trolley for use with a 375mm diameter propane cylinder. 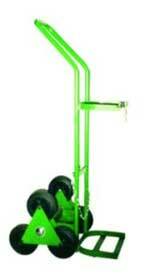 The CT27-P19/47 is a robust 4 wheeled single gas cylinder trolley for use with a 375mm diameter propane cylinder. This robust propane cylinder trolley is designed to carry a single 13 Kg, 15 Kg or 19 Kg cylinder and is ideal for propane/butane distributors and suppliers. Fitted with 200 mm rubber tyre solid wheels as standard. Oxygen/acetylene heavy duty site trolley to hold one of each large size cylinders. This trolley has a strong tubular construction and is fitted with 260 mm or 400 mm pneumatic wheels as standard, it is an ideal trolley for internal and external use. Extra strong tubular and solid bar construction. The cylinders are held in place with ratchet straps. Certified to 1 tonne capacity. Fitted with 2 x 200mm solid tyred wheels with steel centres as standard. This trolley is issued with a mill test certificate. 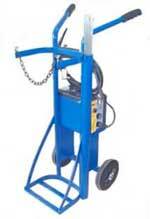 Welders trolley for convenient use of 1 Oxy and 1 Acetylene gas cylinder. This trolley is perfect for use in an engineer’s workshop or warehouse and great use for space saving device. Comes as standard with cylinder holders for welding rods and cable. Steel link retaining chains fitted as standard. 400mm dia pneumatic or solid wheels. Oxy-Acetylene trolley with central lifting eye for lifting with an overhead crane. Extra strong tubular and solid bar construction.The cylinders are held in place with ratchet straps.Certified to 1tonne capacity. Fitted with 2 times 200mm solid tyre wheels with steel centres as standard. 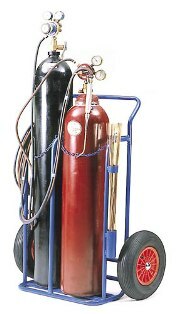 4 wheel oxygen/acetylene or oxygen/propane site trolley. A very robust, safe and manoeuvrable twin cylinder trolley constructed of tubular steel. Fitted with 260 mm or 400 mm front pneumatic wheels and a rear steel centred swivel castors as standard. Designed to easily move 11 gallon casks or kegs. 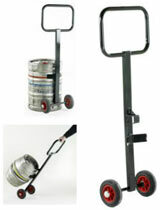 This keg trolley has been manufactured with centre spine with formed hook from flat to locate into hand of keg.